The most favorite side dish for adults and children is the potato puree. Its taste and aroma is familiar to everyone since childhood. 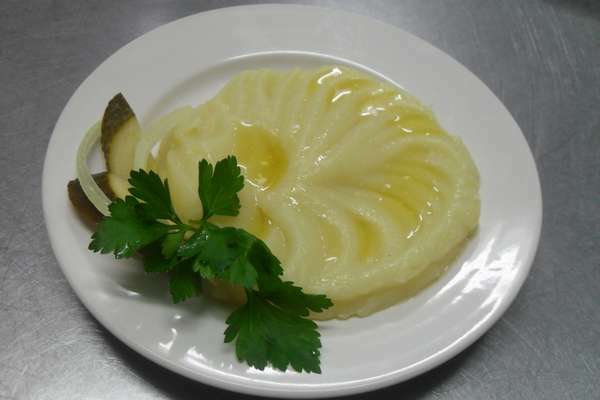 How nice to eat airy and delicate mashed potatoes with fish, meat, mushrooms or chicken. It remains only to learn how to cook a delicious potato puree. The delicious puree is obtained from this cultivar, which is well boiled. Take the potato and wash it under running water. Put a pot of water on the fire. Meanwhile, remove the potato peel a thin layer and put the clean potatoes in a bowl with cold water. Cut the potatoes into equal pieces. This is done to make them cook evenly and faster. Lay the potatoes in boiling salted water. Cook until tender on medium heat. Readiness is checked with a sharp knife. Drain the water in which boiled potatoes in a separate bowl. Mash the potatoes. Add some of the drained water. Continue beating with a wooden spoon, enriching puree air. Heat the milk together with butter. You can replace the milk with cream. Pour in puree and mix well. The mash is ready, but you can make it even better. To do this, fry in butter finely chopped onions. Paste it in the finished puree. Serve mashed potatoes with chopped dill! Enjoy this wonderful taste! Do not whip mashed potatoes with a mixer or food processor! Mashed potatoes get gooey and sticky! To make the potatoes cook faster, put in the water when cooking a small piece of butter.